The 28in. x 22in. 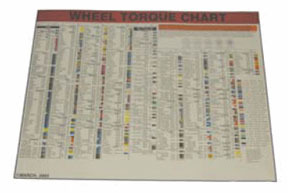 Laminated Wheel Torque Chart is a must for any high volume tire or brake shop. Easily allows many mechanics to quickly verify Wheel Torque values from a distance. Fully updated and includes 29 color coded socket specs and the thousands of vehicles that they work on.